Our incredible finish sets us apart from all the rest. from all other Arts & Crafts furniture makers more than our finish. At first, my plan for this page was to detail the differences between what others claim to be the guiding principals to their finishing regimen and what are the real underlying reasons for their methods. I don't have enough room here for that, so if you want the debate in its entirety, give me a call. Our 30 page Finishing Guide is available in printed form for $16, or download a copy and print it yourself for $11. It contains a summary of all the methods we use, and tips from my 25 years of Award winning finishing. And there are two articles on our work and finishing techniques in the Nov. 1998 issue of "WOOD" magazine. This is the most popular woodworking magazine in the world. After visiting the shop and seeing all of our processes, they saw fit to do a separate article on our finish alone. I sold several thousand finishing guides as a result of the article. The feedback from the woodworkers who use our techniques has been overwhelmingly positive. It produces a stunning depth of color and a feel that is unequaled. We stand by our finish as the finest available. It is entirely compatible with existing antiques, but suffers none of the drawbacks of a thin shellac and wax finish. It imparts a depth and clarity of color that is unequaled. It protects from modern mishaps, by using the absolutely finest of modern materials, without appearing garish and inappropriate in a setting of traditional Arts & Crafts materials. Best of all, it is designed to perform all of this for the life of the piece of furniture. One of the most striking differences in our finish is the "feel". There is an absolute, undeniable certainty when you touch our work that you are feeling something that is as different as night and day from anything previously felt. The preparation that we put into the piece before the stain and finish are applied is based on a thorough knowledge of how wood is going to act over a hundred year lifetime. This is especially true with Oak. Have you ever noticed how rough an antique made of Oak is when compared to one of Walnut or Cherry? This is because Oak has many undesirable characteristics that have earned it the technical designation of "refractory hardwood ". In short, that means hard to work with, hard to finish, and hard to keep in place when it is used. "Mission" furniture is the first mass produced work to be designated as antique. The pieces that exist are not hand made examples of very limited numbers built. They are the survivors of millions of pieces that were churned out by large factories at the turn of the century. Why do so few remain? The short answer is, Oak. From day one, the physical characteristics of Oak are working against long term survival and maintaining a quality finish. Most of the problem lies in Oaks' porosity and its coefficients of expansion and contraction in the presence of changing humidity. The yearly cycle of humidity variations cause pieces to tear themselves apart. It also causes the surface to shrink and swell and "telegraph" through the finish. We address this problem directly at the outset of making a piece of furniture, and solve it with a couple of simple techniques. First, we control our wood supply and the air-drying and kiln drying of all of our stock. Our wood is not heated to 180-200 degrees as is normal in a steam kiln. It is never heated above 115 degrees in the drying process. Thus it never goes beyond a temperature that it could encounter in its course of use in furniture. Next, all cup, bow, twist, and warp is removed from the board through running it by hand through a jointer. Quality furniture is not built out of lumber, it is built out of boards that are jointed out of the lumber. Using a planer or other mechanical surfacer merely flattens the problems, then surfaces the board and releases it. The problems in stability still exist. They have not been removed. Finally, when all of our boards have been made into parts, and the actual finishing process is about to begin, we subject them to a treatment that simulates 100 years of use. When the parts have been sized and machined and are ready for the final hand planing or sanding we take them all to a large tub ( a 200 gal. cattle watering trough ) and spray them with hot water. This raises the grain and simulates 100 years of high/low (summer/winter) humidity cycles. We then sand them with the appropriate grit and rewet them again. This proceeds through a pattern of grits, 60 - 100 - 150 - 180 - 220 - 280 - 320, with every other grit getting a wetting/drying cycle. When we are through, the grain and all of the little whiskers that were waiting on the surface to rise up through the finish are gone. The effect on the finish is immediately apparent. The piece becomes smoother and smoother with each cycle of wet/dry. What is not apparent immediately, is the long term effect that this process will have on the durability, integrity and protection that the finish will deliver over a period of decades. I have pieces in my home that have gone through 25 years of wood heat and no air conditioning. The humidity varies from 75% to 10% throughout the seasonal cycles. They are still absolutely smooth and feel like the day that they were finished. I am not saying glass smooth. One can close their eyes and tell the difference between glass and jade. Our work has the smooth luxurious feel of a piece of polished jade. The "stain" that we use is not a stain at all. It is a water-based aniline dye. It imparts a deep, penetrating color to the wood with no obscuring of the grain. It is the most light fast of all types of coloring products. We have a broad palette of colors to match the variety of shades found in original pieces and others that accommodate virtually any need. 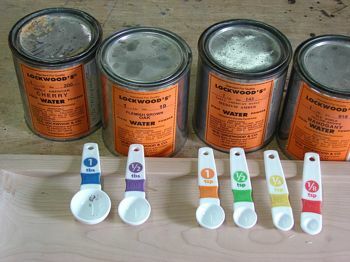 Because we use dyes, we are able to offer many primary, and blended, colors in our Ash furniture pieces. We feel that the explanation of these colors could go on and on without conveying the real beauty and impact of our yellow or red on a crib or set of bunk beds. We supply samples when we receive a deposit. All of our colors, on Oak or Ash, display a sophistication, depth, and complexity that is beyond anything else currently available. Our "topcoat" or final finish takes advantage of all of the advances in the technology with a consideration for what is appropriate to the Arts & Crafts style. This is a complex, well studied application of modern materials that perfectly mimics a finish found originally on the finest work. It has the advantage of being able to handle the assaults of water, alcohol, and the elements that the original finished lacked totally. We will not sell furniture that can not stand even the moderate assaults of water rings and spilled gin. We can please the most discriminating collector, and the pragmatist who is furnishing a house full of children. Samples of our finish can be had by contacting us. We use Sherwin Williams finishing products exclusively. They have developed a broad line of coatings that are used on the finest furniture made, and are keenly aware of the need to accommodate period patinas with their products. They are also unmatched in their understanding of the need for durability, and have developed stable, durable products with all of the visual characteristics of the original finishes. The first coat over the stain is a vinyl sealer. It soaks into the wood and imparts no depth or sheen to the piece. It does provide the best protection against water, and commonly encountered products like alcohol, available today. After two coats of sealer, the piece is hand sanded lightly with 320/400 grit sandpaper. This knocks off all whiskers and imperfections and locks the wood grain in place for the final coats. We then apply three to six coats of the finest lacquer available. The higher wear surfaces get the most coats. Between each coat of lacquer, the piece is hand sanded with 400 grit paper. This further smoothes the piece and develops the soft, easy feel that is characteristic of our work. It also provides "tooth" or the ability of the coats to bond together both chemically and physically. After the final coat, the piece rests for 48 hours and is then hand rubbed with a non-woven Scotchbrite abrasive pad and a rubbing lubricant. This further develops the surface patina and imparts a feel that is unique to our work. OUR finish is a joy to see and touch.